Can’t commit on wall decor? Get the low down on a pretty, inexpensive option you can easily put up—and take down—yourself. Fabric wallpaper is the perfect option for renters and homeowners who want a temporary solution to blah bare walls. Solid or patterned fabric panels are put up with liquid starch, as opposed to the heavy-duty adhesive of traditional wallpaper. Read on to learn all the aspects of this trendy treatment, including tried-and-true application tips. A modern twist on traditional wallpaper, fabric wallpaper is a do-it-yourself décor treatment that’s been catching on recently. Fabric panels are cut to fit the height of your walls and attached with liquid starch—a lightweight, removable adhesive usually comprised of cornstarch, borax and/or baking soda, and water (available at home centers for $10 to $15 per 64 ounces). How does it differ from other wall coverings? 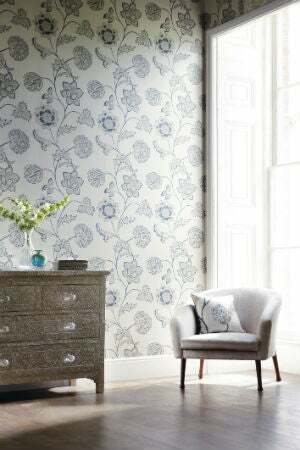 Traditional wallpaper—which may be made of solid paper, paper backing with a vinyl coating, fabric backing with a vinyl coating, or solid vinyl—is intended to be permanent or semi-permanent and so is applied with a heavy-duty paste. Temporary wallpaper is made of durable materials like vinyl, but its peel-and-stick adhesive is easier to remove than wallpaper paste. Fabric wallpaper is the simplest DIY option because it’s basically goof-proof—the adhesive can be removed with plain water, so if you make a mistake while putting it up, it’s no problem to correct. • It’s inexpensive. 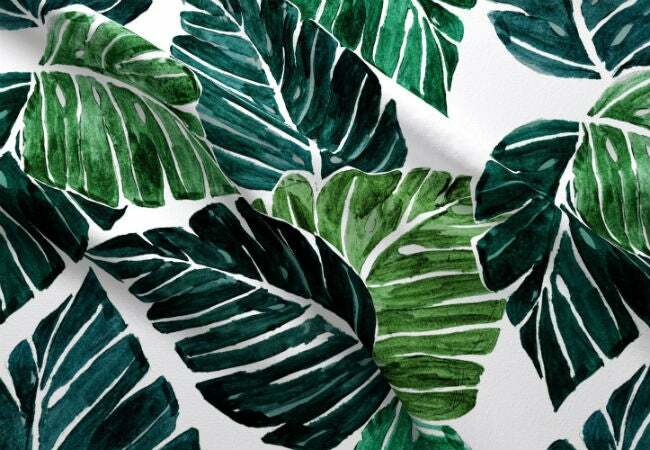 Solid fabric costs as little as $2 per pre-cut 10-square-foot panel or $1.50 per yard of uncut fabric; patterned fabric goes for as little as $8 per 10-square-foot panel, or $7 per yard, making the cost to wallpaper a 10-by-10-foot wall as little as $10.50. Traditional wallpaper goes for $25 to $50 per roll of 25 square feet, and temporary wallpaper starts at $1 per square foot, so you’d pay at least $100 to cover a 10-by-10-foot wall with either option. • It can be quickly, cleanly removed. Fabric wallpaper is removable with a water-dampened sponge without damaging or leaving residue on the wall behind it. Taking off temporary wallpaper is also fairly easy but has a tendency to leave some of its clear top coat behind. Removing traditional wallpaper is a messy, time-consuming process. • It’s mold resistant. Fabric is breathable and porous, allowing air to freely pass in and out. This makes fabric wallpaper less hospitable to mold spores and less susceptible to mold growth than traditional wallpaper and most temporary wallpaper. • It can discolor with heat. The baking soda in some commercial liquid starches can cause fabric wallpaper to take on a yellow tinge when exposed to heat, making it a less-than-ideal choice for behind stovetops, dryers, or other heat-generating appliances. Choosing a dark-colored fabric can help minimize the discoloration. • It’s vulnerable to moisture. Liquid starch tends to dissolve with exposure to water, increasing the likelihood that your fabric wallpaper will loosen and come away from the surface if installed in splash-prone environments like the bathroom or kitchen. What’s the best way to apply fabric wallpaper? Use these tips to ensure that making and applying this DIY wallpaper goes smoothly. • Choose a lightweight fabric. Cotton and polyester are good choices, while wool and velvet are generally too heavy to be held securely with liquid starch. • Buy enough fabric. Measure your wall in inches from ceiling to floor, adding a few extra inches to allow for shrinkage. This figure represents the length that each fabric panel should be. Next, measure the full width of your wall and divide this figure by the width of your fabric (45 or 60 inches are common widths for a single panel or bolt of fabric). Round this figure to the nearest whole number to calculate how many fabric panels you’ll need. If you plan to buy fabric in yards as opposed to pre-cut fabric panels, multiply the panel length by the number of panels and then divide this figure by 36 (the number of inches in a yard) to determine the number of yards of fabric to buy. For example, if your wall measures 120 inches from ceiling to floor, and you add on two inches for shrinkage, each of your fabric panels should be 122 inches long. If your wall width is 120 inches, and you divide this by 60 (the width of the fabric) and round up, you get 2, the number of fabric panels you’ll need. Multiply the panel length of 122 by 2 and divide by 36 to get 7, the number of yards of fabric you’ll need to buy. • Make clean cuts. Use a rotary cutter (a quilting tool with a circular rotating blade), fabric scissors, or a sharp craft knife to cleanly cut your fabric into the previously calculated number of panels. • Apply to a clean, smooth wall. Fabric adhere best to flat, clean surfaces, so patch any holes or divots in the wall with spackling compound, let the compound cure, then sand with fine-grit sandpaper. Vacuum the walls and then wipe them down with a water-dampened rag, allowing them to dry fully. • Position panels with pushpins. Attach each fabric panel to the wall with pushpins at two-foot intervals. If using patterned fabric, be careful to align the print on adjacent panels. When the wall is fully covered, cut holes in the fabric for outlets and light switches as needed. • Apply in small sections. Liquid starch dries quickly, so apply it to the wall with a paint roller in small sections of two-by-two feet. Fill a paint pan with a scant amount of liquid starch. Standing on a ladder, un-pin a small section from the top of the leftmost fabric panel on the wall, then roll on liquid starch to the exposed section of the wall in a thin layer. Immediately stick the un-pinned portion of the fabric panel back onto the wall, using your free hand to smooth, removing any wrinkles or air pockets. Then, push the pin back into the starch-goo-backed section of fabric to hold it in place as the fabric starts to dry onto the wall. Continue on the remaining sections of the panel until you reach the baseboard, then repeat to stick the remaining fabric panels to the wall. • Finish with a top coat. Roll a coat of liquid starch over the entire wall treatment so that it seeps into the fabric and seals it to the surface. Give particular focus to the seams between adjacent panels, as fabric near seams is more prone to buckling and coming loose. Enlist a paint scraper or putty knife to smooth out any wrinkles on the fabric panels and prevent the starch from pooling in any one area. Let the wall dry completely, for at least three hours, and then remove the push pins. • Trim excess after fully dry. The fabric panels will shrink slightly, so wait until the wall has completely dried to trim any excess fabric off the top or bottom of the wall. How long does fabric wallpaper last? The longevity of a fabric wallpaper treatment largely depends on the type and color of fabric and the environment in which it hangs. Less absorbent fabrics like polyester, particular in darker colors, are less susceptible to everyday stains and yellow discoloration than more absorbent fabrics like cotton, especially in lighter colors. And since water dissolves liquid starch, fabric wallpaper tends to hold up best in dry environments like bedrooms or living rooms. 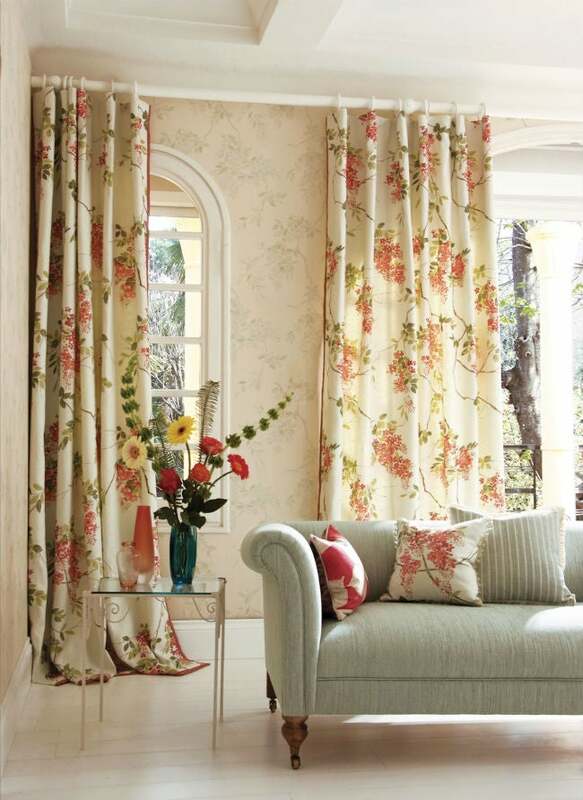 To prolong the looks and life of fabric wallpaper, vacuum it regularly with an upholstery brush attachment. Treat stains promptly: If fabric gets splashed by plain water, blast it with a hairdryer; for other stains, spray with a 50-50 solution of white vinegar and water, then sponge down before the stain sets. If the fabric wallpaper gets too many stains to lift by hand, remove the panels, wash in cold water, and dry on the lowest heat setting, then simply re-apply. What’s the best removal method? Simply lift any two corners of a fabric panel up and away from the wall, then gradually peel away the entire piece. If a panel gets stuck, dampen a sponge with warm water and run it over that section to dissolve the starch. Wipe down any starch residue with a water-dampened cloth.